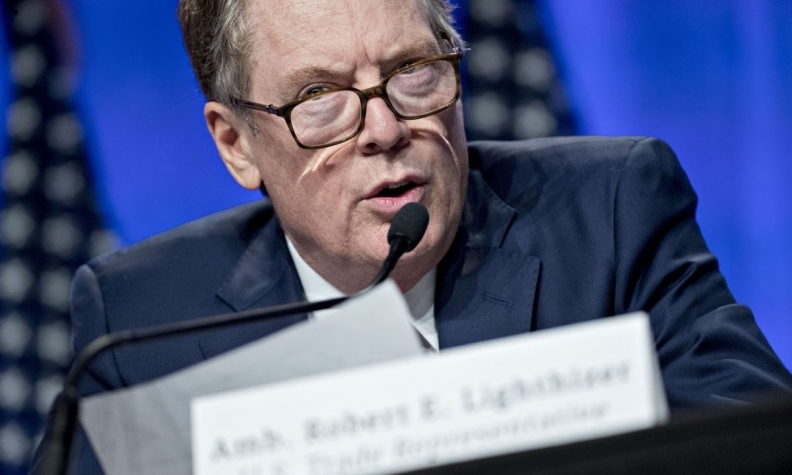 The wage demand was pushed by U.S. Trade Representative Robert Lighthizer during intensive talks in Washington last week on modernizing NAFTA. WASHINGTON -- The latest U.S. proposal for updating NAFTA's automotive rules would carry a four-year phase-in to meet a higher, 75 per cent regional value threshold as well as new labour content rules requiring substantial work at hourly wages of at least $16. A summary of the proposal, seen by Reuters and circulating among auto industry officials based on descriptions from Canadian and Mexican trade negotiators, would require the US$16 wage on work comprising 40 per cent of the value of light-duty passenger vehicles and 45 per cent for pickup trucks. The wage demand, pushed by U.S. Trade Representative Robert Lighthizer during intensive talks in Washington last week on modernizing the North American Free Tree Agreement, are aimed at preserving U.S. and Canadian auto production and putting upward pressure on Mexico's low auto wages. The Center for Automotive Research has estimated that Mexican auto assembly workers average under US$6 an hour, with workers in parts plants averaging less than US$3 an hour. The U.S. proposal calls for overall regional value content to rise to 75 per cent from the current 62.5 per cent, but significantly lower than USTR's initial 85 per cent demand. Automakers would get a four-year phase-in rate for light passenger vehicles, but only two years for pickup trucks, which are a key high-value product segment that USTR views as important for U.S. production.